Our brief stay at La Pianca is now under our belts and we are off to Fattoria il Lago for three weeks in Tuscany – and hopefully some sunshine. As we were approaching our destination, I turned to our trusty SatNav hostess, The British Lady (who is preferable to the commanding ‘Man Voice’) to guide us to our next home. I entered the GPS details into the SatNav, only to discover that they did not read properly – we had too many digits for latitude and couldn’t get to the longitude. We had no Internet hookup obviously, so we were a little stressed as to how on earth we would find our next home in the many rolling hills of Tuscany. Luck was on our side as we pulled into Dicomano, the town closest to the villa. We were forced to make a left turn at one point in the town, and there, hammered to a tree was a sign “fattoria il lago” waiting to guide us up the hill. The road – and I use that term VERY loosely – is a hazard. In fact I didn’t realize it was actually a road; I thought it was their driveway. 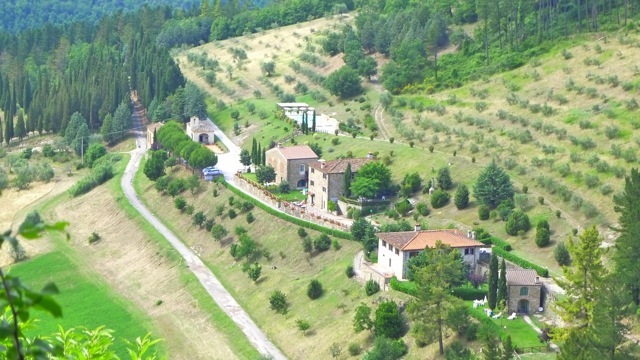 It is one way for sure and full of blind corners.We are staying in the villa Cimabue. It appears that all of the villas here are named after Italian artists. 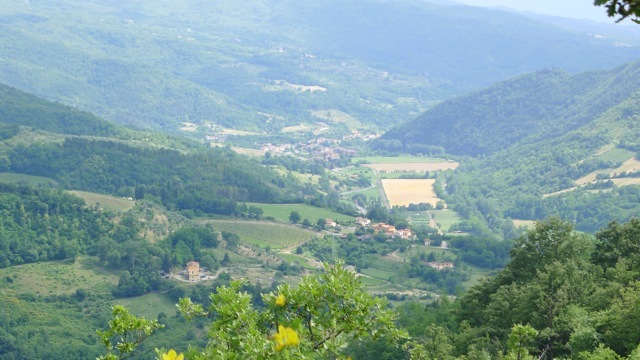 We have a commanding view of the town and valley below. It is gorgeous. Across the crushed gravel drive is the chapel (handy for all of the churching we’ll be doing…) and above us under the olive grove is the pool.